Happy 150th birthday Portage and Main ! Here is a collection of short stories about our most famous intersection. Hopefully some of them are new to you ! Check out my post from last week for more links to 150th anniversary related media and posts from other blogs ! The origins of the "Portage Road" dates back to the late 1850s. 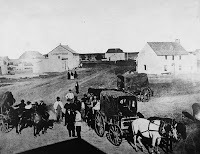 It was a surveyor's line that divided sections of land, with the Red River Colony to the north and the HBC reserve to the south, a sort of no man's land that people began using as an east-west cart route to Portage la Prairie. Main Street, on the other hand, dates back decades earlier as a trail leading from Upper Fort Garry to the resource-rich north. At the city council meeting of August 3, 1875 the Board of Works set aside $2,500 to grade the intersection of Main Street and Portage Road but the HBC had other plans. 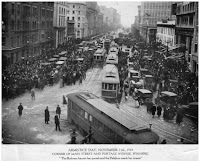 They had already created two east-west routes (Broadway and York) that intersected Main Street at points that were favourable to their commercial interests. The HBC filed a court injunction to stop the city from doing any work that would formalize Portage and Main. They wanted the surveyor's line declared their property so that they could charge anyone using it for trespassing. 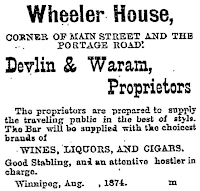 The city won the day and in September the intersection was graded and Portage Avenue began to boom with new hotels, dry goods merchants and even brothels ! 2. What's in a name ? "The Portage Road" was an informal name, referring to the fact that Portage la Prairie sat at the end of it. In October 1881 a petition signed by 20 landowners was presented to city council requesting that it be renamed 'Queen Street". Council approved the change at their November 21 meeting and drew up plans to combine Portage Road and Thistle Street,(present-day Portage Avenue East), into a single Queen Street. As Portage and Main established itself as the city's premiere address the big banks moved in. The oldest and grandest of the banking halls at Portage and Main is the Bank of Montreal Building. The bank chose one of North America's premiere architectural firms to design the building. McKim, Meade and White had designed the Boston Public Library, Rhode Island Capitol Building, Penn Station in New York, Manhattan Municipal Building and the renovation and expansion of the east and west wings of the White House in Washington, D.C.. Many of Portage and Main's happiest and saddest moments involved war. 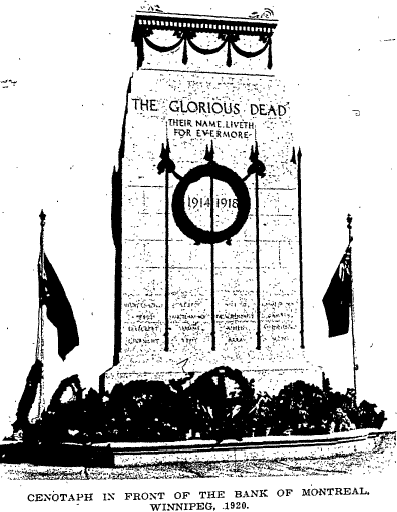 Winnipeggers awoke at 1:55 am on November 11, 1918 to a great noise. When word came that Germany had surrendered, policemen blew their whistles, school and church bells rang, and trains and factories blew their steam whistles. Soon, thousands of people were on the streets, first to the Free Press Building on Carlton to hear the news for themselves, then a series of parades began down Portage Avenue, led by bagpipers, buglers and 'gaily decorated cars'. "Men and women and boys and girls appeared on the street so quickly that one might think they crept out of shadowy doorways. They carried flags and they shouted for the very joy of the moment. It was over. Dear ones would be coming home. Long nights of waiting and wondering were past. They cheered again and verily danced for joy ." When it came to paying tribute to those who died, Winnipeg again turned to Portage and Main. 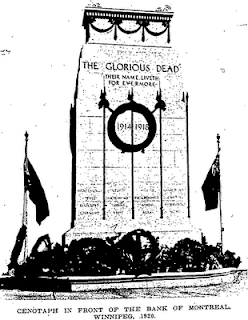 In 1921 a temporary cenotaph, a replica of the one erected in Whitehall, London the year before, was erected at the intersection. 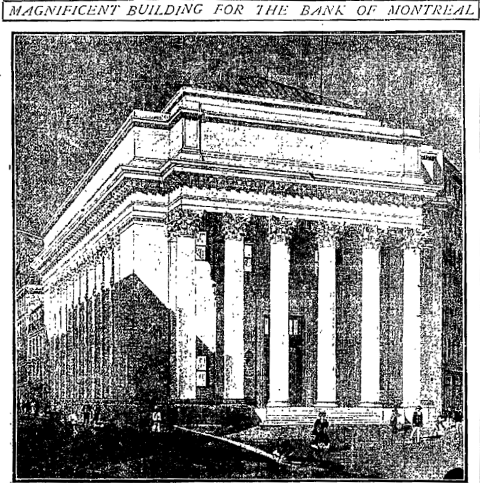 The cenotaph was removed in 1923 to allow for renovations to the Bank of Montreal building. In its place a statue known simply as 'World War One Soldier' was erected by the bank to commemorate their employees who died during the war. The artist who won the international design competition for the memorial was American James Earl Fraser who also created the Patten Memorial at West Point and the Benjamin Franklin Memorial in Philadelphia. His being American led to one flaw in the statue that was pointed out by Veterans as soon as it was unveiled: the man is depicted in the uniform of an American soldier. By 7:30 the full force of the announcement was reflected by a jammed Portage Avenue and Main Street. It stayed that way well on past midnight.... Winnipeg took down its hair and wept, cried, laughed, sang, danced, drank, celebrated and prayed through the entire night. 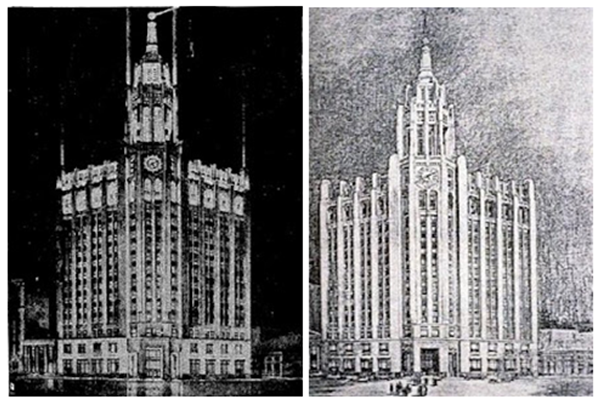 On October 12, 1929 James Richardson and Sons broke ground on their new, $3 million, 17-storey building - the tallest in Winnipeg. The project was barely underway when the stock market crashed and construction ceased. The site was a surface parking lot until 1967 when plans for the current Richardson Building were announced. Two of the current developments at Portage and Main were supposed to be a lot larger than what we see now. In exchange for the massive project the city had to make a number of concessions to Trizec. To start, they took responsibility for the expropriation of dozens of buildings that needed to be demolished. They agreed to build the foundation for the new buildings, (which doubled as the Winnipeg Square parkade), the cost of which ballooned to $11 million. Finally, they built the underground concourse and agreed to close the intersection of Portage and Main to pedestrian traffic for a period of 40 years. In 1987 another large project was announced for Portage and Main. The TD Centre (now 201 Portage) was to be a two-tower development. While construction on the initial 33-storey tower was underway, the developer said that once it was 80% leased, details of the second, 23-storey building would be announced. That tower never materialized and is now the building's outdoor plaza area, home to the Aspertron. 7. Santa Claus wuz here ! Christopher "Kris Kringle" Kendall was a well-loved fixture at Portage and Main for 25 years. 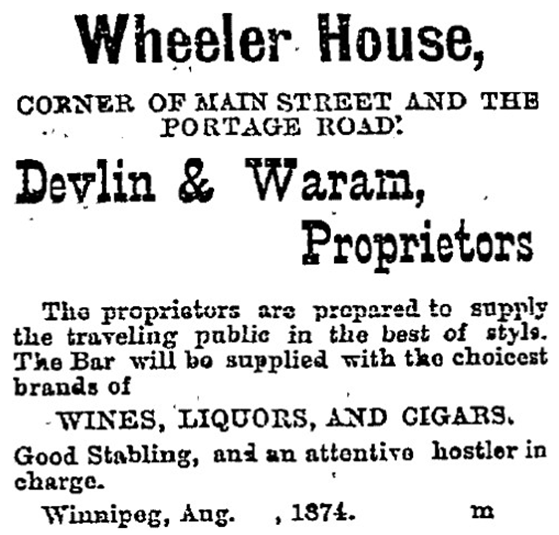 Born in England, Kendall came to Canada and farmed in Saskatchewan and Manitoba before coming to Winnipeg and selling newspapers in front of the Child's Building, (where 201 Portage now stands.) His likeness to Santa Claus in appearance and spirit made him a popular figure. The Free Press went so far as to have a portrait made (above) which hung for decades on the fourth floor of their Carlton Street building. Kendall was a life-long bachelor who lived in a small apartment at Sargent and Furby. He retired in 1959 and died months later on May 3, 1960. He was 81 years old. I always find your posts interesting, but am also frequently saddened by seeing what beautiful buildings were demolished, planned but never executed, or the worst - something demolished and nothing built! Sometimes ignorance is bliss! Great work! Favourie memories of Prtage and Main: the signing of Bobby Hull to a WHA contract and the spontaneous celebrations when it was announced the Jets were coming back. Worst memory: When they barricaed the street to pedestrians. So, since Trizec never lived up to their end of the bargain, why can't the City open up the intersection to pedestrians again? Rumours are that Artis REIT is about to announce a 40-storey apartment tower for "pad 2" of the Trizec site, along with a "recladding" of 360 Main St.